I fully endorse the idea of using custom coffee mugs as promotional gifts. Next to water, coffee and tea are the most popular hot drinks around the world and in the certainly in the business world they are recognised as the typical workplace beverages. Probably much like yourself, I regularly attend conferences and networking events and can vouch for the fact that either coffee or tea will be the beverage of choice amongst almost all of the attendees as well as the organizers. When at business meetings with client’s and suppliers, I am almost 100% sure that the secretary will be called in to get each of us cups of tea or coffee. Just the aroma that emanates from a freshly brewed cup of coffee can give me an immediate boost on the most tiring of days and the very first sip is just bliss. Like thousands of others around the world, I am addicted to coffee and I would readily drink it anywhere, any time. If you are looking for gift ideas for your business promotions, you should not overlook the brand value of custom coffee mugs. Something that gives you potentially 8 or 9 hours a day (and more), 5 or 6 days a week, 52 weeks a year advertising space is definitely a winner. Whether you own or run a large, flourishing business, a mid-size business or a small, start up business, the most important thing is to gift promotional items that are high quality as well as useful to the recipient. While larger corporates have higher marketing budgets and can afford to give away higher-end, expensive promotional products without feeling the pinch. Smaller companies obviously have tighter advertising budgets and need to find more affordable products without compromising on their quality or their purpose. This is where custom coffee mugs score over other corporate gifts. Mugs of any type are affordable without looking cheap. They have a high perceived value and great potential for maximum exposure of your brand or message throughout the day and every day. They come in a wide assortment of sizes, shapes and styles to suit all budgets from the most stringent to the most extravagant. Mugs are available in a wide variety of materials, from cost effective ceramic earthenware to the more expensive porcelain bone china and even stainless steel and other metals, as well as cheaper options such as acrylic or plastic as well as spill-proof metal or plastic insulated travel mugs. If you spend a little time browsing around, you are sure to come across coffee mugs that look classy and yet have a down to earth price tag. Should you choose plain white mugs or should you go in for coloured mugs? While both choices are equally effective, research shows that coloured mugs with striking images have a greater visual impact and will give your brand promotion a tremendous boost. However from my experience many people prefer to drink tea or coffee from a white mug or cup. Personally I agree, it just doesn’t taste the same from a coloured mug. There is a solution to this dilemma, which is a Duo mug, white on the inside and coloured on the outside, problem solved. Ultimately, what you choose depends upon the image you would like to portray as well as your marketing budget. There are an endless variety to choose from depending upon your preference and your budget. After you’ve selected the mugs, you can then customize them to suit your objective, which is to promote your organisation and brand. I have a collection of coffee mugs given to me by various companies. Despite having so many in my office and kitchen, I still get excited every time I receive yet another one. Every time I feel like drinking coffee, I use a different mug and while I sip my coffee I find myself automatically reading the name of the company and the other details featured on the mug. I’m sure there are many other people who do this too. Can you imagine the exposure you would get if you gave out coffee mugs with your brand name and logo imprinted on them? Every time someone uses your company’s custom coffee mug, it’s not just the person drinking the coffee that will think about your company. There are bound to be several others whose curiosity is sure to be piqued and they will want to read the details too. The right message is sure to attract even more clients to your business. Coffee mugs that are customized with your business details truly work as subtle reminders. Which Type of Custom Coffee Mugs? 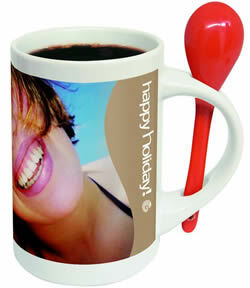 For general promotional use, the most popular are earthenware or ceramic mugs. Typical examples are the 330ml capacity Cambridge mug (sometimes known as Durham) with straight sides and a large handle, ideal for any trade. The 330ml Sparta mug, with a smaller and squarer handle and flared lip. The 280ml Lincoln mug, which is a slimmer version of the Sparta or the 340ml Atlantic mug, a wider version. For slightly more shapely models go for the 280ml Bell mug with an attractive curved shaped base and ear shaped handle or the handsome 375ml Marrow mug, elegant tapering sides and medium sized curved handle. All of these are very cost effective and smart looking options and generally available printed from 75 units. For boardrooms, meeting rooms, special gifts and lighter weight mugs porcelain and bone china mugs are probably more appropriate. There are many stylish options such as the 390ml capacity Windsor mug, 320ml Kensington mug and 330ml Balmoral mug or why not go for the Capuccino cup and saucer or the Sterling straight sided cup with saucer, which is also ideal for tea. Try something a little more unusual. Wow mugs with a heat sensitive coating which will go clear when hot liquid is poured into the mug, to reveal your message on the outside. This could be a great novelty for temperature related promotions or products or perhaps a launch of a new service. If you have a full colour design and dramatic artwork, you need to look at ceramic of bone china Photomugs. 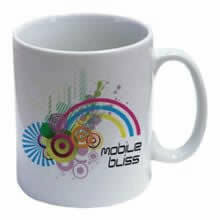 These have high quality vibrant colour prints which can wrap around the full outside surface of the mug. For people and promotions on the move - Plastic and stainless steel insulated travel mugs are really popular now. With more and more coffee shops available people are grabbing a take-away at every opportunity. It is not always practical to use the standard cardboard takeaway cup whilst in your car or on the move. Decanting the coffee into your favourite travel mug makes perfect sense, far more practical, much easier to hold, keeps hot and with a substantial screw fitting lid so that you don’t end up with scalding coffee down the front of your shirt or in your lap. There are also rigid plastic versions of the authentic takeaway cups available such as the Americano takeaway mug, with screw fitting, drink thru lid and a special silicone grip band for a firm hold. Re-useable, eco-friendly and stylish. Deciding on the details that the mug will feature is important. Many people are going to be reading these details so make sure you make the most of this opportunity. While you will need an eye-catching design, it should also not be cluttered with too many details. The name and logo of your company should be featured clearly with just one sentence or maximum two sentences stating the catch phrase of the company or describing the business. You should also include your phone number, email address and website information. Postal address details can also be included but only if the design is not already too busy, bear in mind that the user should always be able to find out your contact details if they visit your website or phone your office. Remember, with artwork generally ‘less is more’, your design will have more impact with a striking image or logo and just the basic details. One of the most effective designs I have done recently for our own company mugs was a colourful Jellybean design on Photomugs. Around 75% of the design was the jelly bean image, our logo, website, email and phone number where shown around the bottom section. We also mentioned on the mug that this was a ‘limited edition’. Our clients loved them and we received a great deal of very positive feedback. There are several different options for distributing your custom coffee mugs. Mugs are generally quite bulky and the ceramic ones are also quite heavy, which can be a costly items for postal mailing. Therefore why not make a point of giving them personally to your clients or potential clients at trade shows and office visits. What about filling them with candy or cookies and perhaps gift wrap them? Some of my clients have filled their custom coffee mugs with small chocolate or candy eggs at Easter time, foil wrapped gold coins and chocolate bars at Christmas time and chocolate truffles for Valentines promotions. If it is a special occasion, go all the way and gift your loyal clients a complete coffee gift hamper that includes special roast coffee beans and a pair of customized coffee mugs. If you prefer to mail your mugs for a campaign. Make sure that you package them properly to avoid any unfortunate breakages. There are special 2 part polystyrene packages and cardboard mailing cartons especially for ceramic and porcelain mugs, available from your promotional products company, ideal transit protection for your mugs. Travel mugs can be mailed in padded envelopes but again it is worth investing in some suitable sized mailing cartons to avoid the mugs arriving with your client dented or cracked.